I saw the first [fake] OP, Super Heroes Legend and I thought I click on the wrong ep or the site uploaded under the wrong title.. hah. >_> but I sat through it and saw Moritaka and knew that I was watching the right episode. OMG, I adore Takagi. He is really funny with his melodramatic movements and speech. It’s just too cute. hah. I only read the first chapter of Bakuman but I think the anime did a better job at conveying the humor and melodrama. Moritaka, his nickname is Saiko, I wonder how they came up with that, but anyways, he’s so… so… boring. Like, he doesn’t have any goals that he wants to do and settles for living a dull life. COME ON, NOW. Why would you settle for such a life. It’s comprehensible.Good thing Takagi came along to help him find a goal and it is to team up with Takagi to become a manga artist to be able to marry the girl of his dreams. 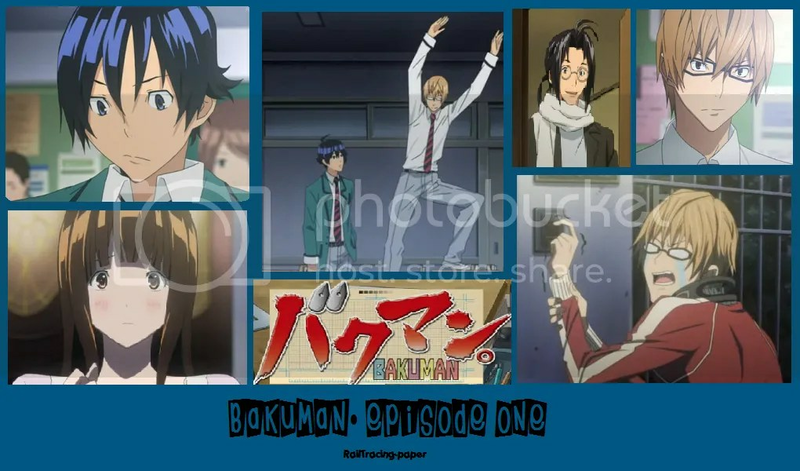 This entry was posted in Anime, Bakuman (anime), Currently Watching and tagged anime, Bakuman. Bookmark the permalink. Eiji? O.o I’m guessing he’s a character that hasn’t been introduced yet, right, right? ahah, I looked him up on google. His color seems to be red. He seems interesting. Who’s your favorite character?